The Pretty Lady Veterinarian and I were in search of lunch in Santa Monica, CA. 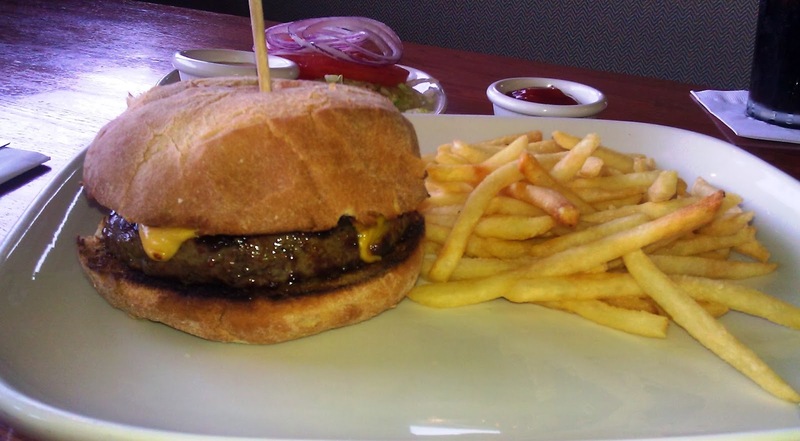 Truxton's American Bistro was nearby, uncrowded, and they had a burger on the menu. Metered street parking was plentiful. Truxton's did offer parking in the attached lot (behind) for a fee, but I found this galling. A) I had no cash on me, and B) I resented being required to pay to park at an uncrowded restaurant when I was already going to pay to eat there. Truxton's was relatively new (opened in July of 2013), and the employee count pretty much matched the customer count at the time of my visit 14 to 18. I spoke with the manager to get a feeling of what to expect of the burgers. We settled on a couple of tasty sounding choices. 14 short minutes later our cheeseburgers arrived. PLV noted that her Arnold Palmer was the best that she had ever tasted. The Beef: Truxton's American Bistro based their beef burgers on an 8-ounce patty of custom-blended beef sourced from Premier Meat Company. Premier Meats has never done me wrong, and this trend continued with Truxton's. The beef patty was juicy (drippingly juicy), beefy, and it presented a strong taste of minerals. I didn't detect any funk from aging, and I guessed that the fat content was a hair above 20%. While the staff was unsure about the cuts of beef in the burger, my best guess was Sirloin, Filet, and some Chuck. Regardless, the beef was of a high quality, and the flavor profile was simple and satisfying. The mouth feel was tender and somewhat finely grained. The tenderness led me to believe that Filet was employed here. The beef was a winner. Truxton's also featured a veggie patty, and this was such a hit that Sysco Foods picked it up and became a reseller. I did not try the veggie patty. The Seasoning: The exterior of the burger patty was liberally salted and treated with a hint of pepper, as well. The seasoning brought out the best of the uncomplicated beef. The Sear: Meh. 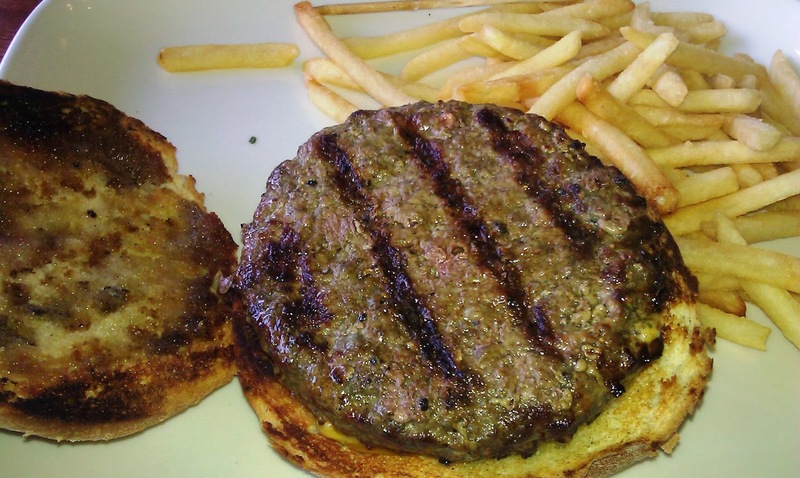 Truxton's used a gas-fired grill to cook the burgers, and this grill simply did not have the oomph to apply a proper and crisp sear to the burger patty. This may have been a stylistic choice to deliver a more luxurious and uniform mouth feel. Still, a thorough sear would have been a nice touch and would have put this really good burger into the realm of greatness. The Preparation: I ordered a Med-Rare cheeseburger, and I got a Med-Rare cheeseburger. The beef arrived pre-ground from Premier Meats, and it was left alone until it was gently prepped by the Truxton's kitchen staff. The burger patties were uniformly thick and perfectly tender throughout. Standards were well-maintained. The Bun: This was a lovely Torta roll from Ca' d'Oro Bakery. Ca' d'Oro has never let me down, and this was no exception. Upper West, The Six, and STREET also used fantastic Ca' d'Oro products, so Truxton's was in good company. The Torta was tender, fresh, moist, a little chewy, resilient, and just sweet enough to work with the savory seasonings. The bun was moderately toasted, and this gave a bit of crunch to the bites from the perimeter of the burger. The Meat To Bun Ratio: This was perfect in both my plain cheeseburger and PLV's tarted up and heavily topped Sonoma burger. The Cheese: I went with American Cheese. I had a multitude of choices including Swiss, Tillamook Cheddar, Cambozola, Fontina, Mozzarella, and Pepper Jack. The American cheese slice was nicely melted, and it contributed the usual iron notes and creamy texture to the burger. 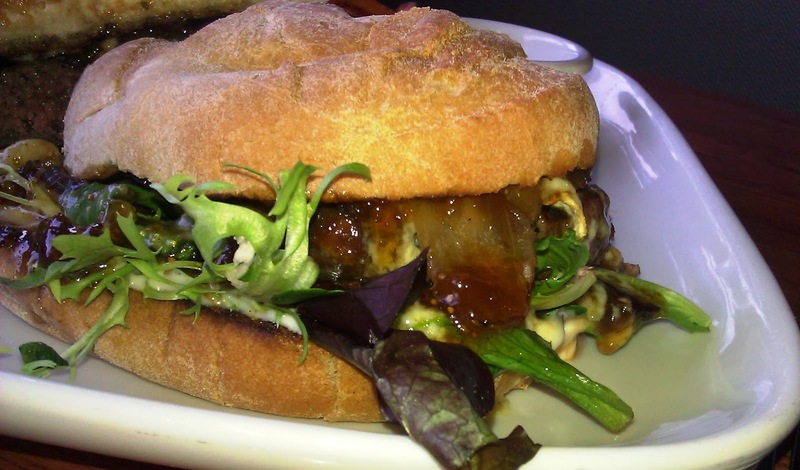 The Cambozola on PLV's Sonoma burger was delightful. Cambozola is a mild, triple cream, Bleu cheese--like Gorgonzola without the commitment to finding a toothbrush immediately after finishing eating it. The Fries: The fries at Truxton's American Bistro were an upcharge, and for 2 bucks they provided a fistful of competent fries. The fries were of the frozen, bagged, peel-off, par-cooked, and shipped-in variety, but they were properly cooked in a canola blend. The fries were also properly salted. The burger was large enough that the fries were overkill. The Value: Two burgers, two sides of fries, and two soft drinks (including tip) came to just over $42. this was steep for lunch, particularly for burgers. Still the quality of the ingredients was very high. The value was about average. Happy Meal enjoyed half of my burger when he got home from school, and he gave it an enthusiastic thumbs up. PLV was equally pleased with her burger. The burgers at Truxton's American Bistro were thoughtfully prepared by a skilled staff using quality ingredients. Burger Review : Truxton's American Bistro served up really good cheeseburgers sourced from high-quality ingredients from amazing vendors. This is one of the better burgers in Santa Monica.